The Compendium is the most exhaustive resource on the topic of speed. We are excited to help guide you on the quest for greatness. Upon purchase, you agree to connect with Coach Banta or Buckvar via Facebook video chat or Google hangouts. If you miss your scheduled Consult your purchase will not be refunded and the option to reschedule will be at the discretion of the coaches at www.sprinterscompendium.com. Please make arrangements to be available at times conducive to the coaches at www.sprinterscompendium.com. To be efficient, make sure that before the scheduled consult you are prepared with your questions in advance. If you choose to use our services you must be an English speaker and provide us an email to arrange the time of consultation. We look forward to connecting with you in a timely manner and helping you with your coaching needs and inquires. The Sprinters Compendium is different. Ryan Banta has produced a labour of love unique in its scope based on knowledge hard earned through his own coaching experiences as well as those of so many of the world’s leading coaches who have contributed to this unique and brilliant publication. The accumulated advice of so many contributing coaches tallies centuries of practical experience where information has been distilled into the essence of knowledge. When these great coaches write their thoughts they call upon empirical evidence based in their actual outcomes, the processes, and findings along the way at every level of performance from junior college to Olympic finals. I found the Sprinters Compendium a revelation, challenging every belief I have held about every aspect of coaching and obliging me to face the fact again that there are many paths to the summit of the high-performance mountain. Returning to track after 10 years had me searching for a lot of answers, even more so coaching a team of World and national level Master sprinters dealing with questions on programming, technique etc. Ryan Banta not only supplied those answers but he also did so in a very structured and functional way. His methods simply make sense. Furthermore, I've since connected with Ryan and he's been an excellent and approachable guide and his methods have been key to my transition techniques as well as my taper methods directly leading to my gold medal in the World Masters Championships in Perth Australia fall of November of 2016. I recommend anyone in the track and field industry to read his book Sprinter's Compendium, you won't be disappointed. This book shouldn't be classified as a book for sprinters but as a resource for all coaches. There is a wealth of information that can be applied for athletes running the 60 meter dash all the way up to the Marathon. Let's face it, when it comes to track and field, it is never a bad thing to know how to run fast! The "Sprinter's Compendium” is a massive journal of sorts based on a life long inquiry and work by a true student of the art and science of sprinting. It mirrors the work designs of Ken Doherty’s Omni-book but with an emphasis on sprint events. I appreciate the format in that it presents a broad spectrum of beliefs, practices and discussions occurring around the world in these sporting disciplines supported by direct conversations, papers and studies supplied by a very diverse lineup of respected coaches and scientists. It delivers useful material for a beginning coach and transcends to topics that are currently the debate at the most elite levels of sprinting research. The breadth of topics, examples, conversations, reports supply us with a library of materials to spur future personal development for months and will no doubt be conversation starters at any gathering of coaches in the future. For anyone who has ever written a book, one knows the struggles and man-hours involved. I can’t imagine the journey by Ryan Banta on this one. 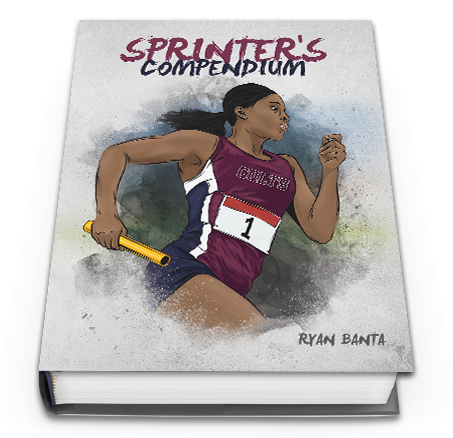 The Sprinter's Compendium will accelerate your athletes and your coaching. Ryan is a successful high school coach. His athletes have achieved 109 school records, 3 top four finishes at the state championships, 5 district championships, 180 state semi-finalist (sectionals), 122 state qualifiers, 2 state records (3200 and 4×800), 14 national ranked events, 57 all state performances, 10 state champions, 11 runner up performances, and 2 Gatorade athletes of the year. Ryan is a USATF level II coach in the sprints, hurdles, relays, and endurance and recently earned a USTFCCCA track and field technical coaching certification.